If you are looking for a place to relax and recharge, look no further. Enjoy the country side of the island and avoid the crowds and traffic of Waikiki. Our private beachfront home will suit all your needs, whether you are a couple looking for a romantic getaway, or a family looking to spend some quality time together. The property is large, almost a 1/2 acre in size, situated close enough to see all the sites and far enough away to feel like you are on your own private island. The grounds are pristine, enclosed with beautiful landscaping on three sides and 91 feet of oceanfront beach on the fourth. There are 3 patio areas, a hammock overlooking the ocean and a side yard large enough for a game of catch. 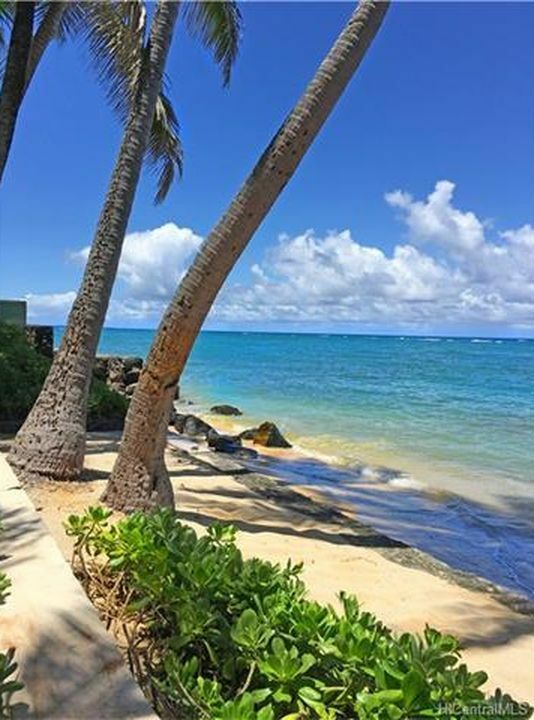 You can snorkel, kayak, fish and swim right from our front steps, and if you leave the property you will find other breathtaking beaches and challenging (very!) "off the grid" hiking trails as close as 5 blocks away. For day trips, you'll find the Polynesian Cultural Center just 10 minutes up the road, and the famous "North Shore" beaches just another 10 minutes from there. Head the other direction and you can find the Kualoa Ranch, , location for many TV shows and movies including the Jurassic Park series. The ranch offers Horseback Riding, ATV Tours, a Jungle Expedition Tour and Zipline. The Kaaawa Retreat is the perfect place for your memorable and relaxing vacation. The house is immaculate, and offers all the modern amenities you can expect from a condo or hotel. The kitchen is freshly updated. The living room offers cable TV and air conditioning, and there is wireless internet throughout the house. The property has just been updated with all new 4K smart TV's that allow for streaming to hundreds of sites. The living room has a 55 inch and each of three bedroom rooms have a 43 inch, all attached to cable. There are ceiling fans in the bedrooms for your comfort as well. People love coming back to our special hideaway. Plan your day trips and look forward to returning to a relaxing comfortable home base. Special care is taken to provide you a clean, comfortable place to enjoy your vacation. Lush, beautiful setting, great location, lots of privacy. Time to relax and enjoy friends and family. Air conditioning, No Smoking inside. This location is great! the Beach is your back yard where you can watch sunrises. The mountains are in your front yard. You see them all along the drive to this small city of Oahu. It's small on the map but close to Kuala Ranch where there is much to see. Make sure you enjoy the park across the street from there. Beaches and parks near by. Close to the North Shore, Polynesian Center, Waimea Valley, Dole Plantation. Just remember its a drive all over Oahu. This is a perfect location for enjoying all the beauty of Oahu. The home itself is beautiful, large rooms, comfy beds, great patio, outdoor shower. (Don't stay in the city, you'll be disappointed. )Great customer service. Our family of four ( 2 teens) spent two weeks in this villa and we had great time. We got everything we need in this private spot well was exactly what we were looking for to visit Hawaii Islands and relax for vacation. We were so pleased with the beach house, private beach, secluded garden, views of mountains. There is not much in Kaaawa & we arrived provisioned for the week. Close to PCC, shrimp shacks, Kualoa Ranch. We appreciated the AC whenever we were not outside on patio, beach, sea wall. Our family fell in love with this beautiful beach front home! The moment you drive thru the gates the view is breathtaking, grounds are pristine and beautiful, beach front to the east and lush mountains to the west. Stunning views in every direction. The house is precious and was perfect for our 10 day family vacation! We wanted a place that was away from the hustle and bustle of the Honolulu and hotels, and we couldn’t have been happier. The three bedrooms were nice and spacious, the master bedroom had a great view of the backyard and ocean, loved laying there watching the day come alive in the morning. Fabulous back porch with a covered awning, we sat back there for hours every day visiting, eating, catching up on work, reading a book, enjoying the view...definitely my favorite spot! My husband and I renewed our vows this trip after 20years, and we will definitely be returning with our family again and can’t image staying anywhere else but this fabulous Kaaava beach front home! Ideal location if you want to be away from busy Waikiki. Beautiful property! We absolutely loved our week’s stay at this home, and found the location great for our interests. Every time we would return home after our daily adventures, the beauty of the view and landscape would impress me. Loved watching the sunrise each morning, and found the beach very quiet (few people). Home is just as pictured, and was very clean and well stocked with basics (tp, soap, trash bags, etc.). Only downside was that because we had to run the fans in the bedrooms at night — (no A/C except in the main living area) — we didn’t get to hear the ocean waves from our beds. But the fans did keep the rooms habitable, so we were very glad to have them! Thank you so much for sharing your experience. We are pleased to hear of your obvious enjoyment...and are sure that future guests will be as well. Please do visit with us again one day soon! Located on the country side of the island, you are away from all the crowds of Waikiki. Kualoa Ranch is about a 5 min. drive east . The ranch has lots of activities for all ages, restaurants, tours and horseback riding.